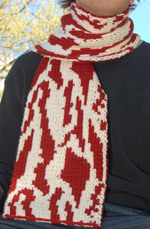 This pattern is an official protest to the bacon issue of The AntiCraft. The scarf is double knit out of Blue Sky organically grown cotton so it is reversible and no animals were harmed in the process. 12.5 sts and 18 rows per 4"/10cm in stockinette stitch. This scarf is double knit to make a reverse image on the backside. In double knitting, you get a double-thick, two-sided fabric where both sides look like the right side of a stockinette stitch fabric. Each square in the bacon scarf chart represents two stitches, one on the front and one on the back. You will knit the first stitch of the pair in the color indicated by the chart with both strands held to the back and then you will purl the second stitch with the other color with both strands held in the front. If you need help with double knitting, knittinghelp.com's Advanced Techniques section has a video on double knitting. Using a circular needle will take some of the weight off your wrists. Using a long tail cast on, CO 60 stitches with MC. When working the chart, place stitch markers 20 and 40 stitches in. This will correspond to the red heavy lines in the chart and make the chart faster and easier to read. Repeat the chart five times. 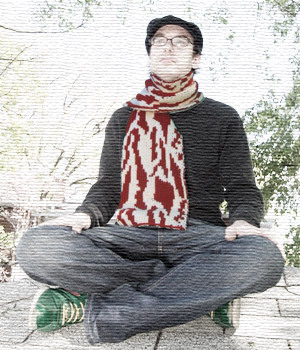 For a longer scarf, knit until you run out of yarn. It doesn’t matter where you are in the chart when you end. BO two stitches at a time in MC (i.e., instead of knitting one stitch and then passing a stitch over it to bind off as usual, k2tog and then pass a stitch over it to bind off). Block into shape and weave in ends.